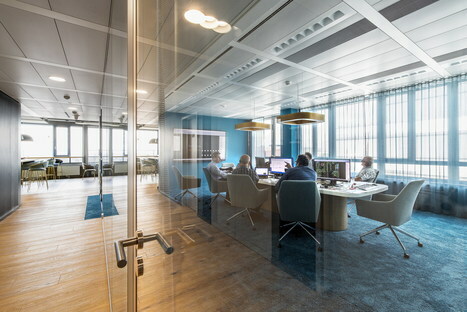 Swiss firm Evolution Design worked in conjunction with their client, PULS to craft the new PULS Vario workplace in Vienna. Because the spaces designed as innovative think tanks can really make the difference to creativity. We’re all well aware that our architectural surroundings have a great impact on the wellbeing and performance of whoever lives there. It’s a proven fact in both education and healthcare and is just as true in the workplace (link Sri Lanka). A great example of doing it right is in the offices of PULS Vario, the Vienna-based branch of the German engineering firm PULS after Evolution Design had designed its headquarters in Munich. Because their earlier collaboration had been so successful, PULS approached the Swiss design firm again. This time they worked with the new PULS team in Vienna and its Munich-based design team. This new office has been designed on the basis of the concept of the Vierkanthof, a traditional Austrian country farmhouse complex where everything is arranged around a central courtyard. Evolution Design took this type of architecture and transposed it into a modern, creative workplace where the various experts can work closely together to reach their common goals. In line with the scheme of the Vierkanthof, the designers divided the workplace into four main zones: RETREAT, DIALOGUE, CREATE and SHARE with each one following the creative workflow that actually mirrors certain models of Austrian life. The vital first step towards generating ideas is a calm think tank area. 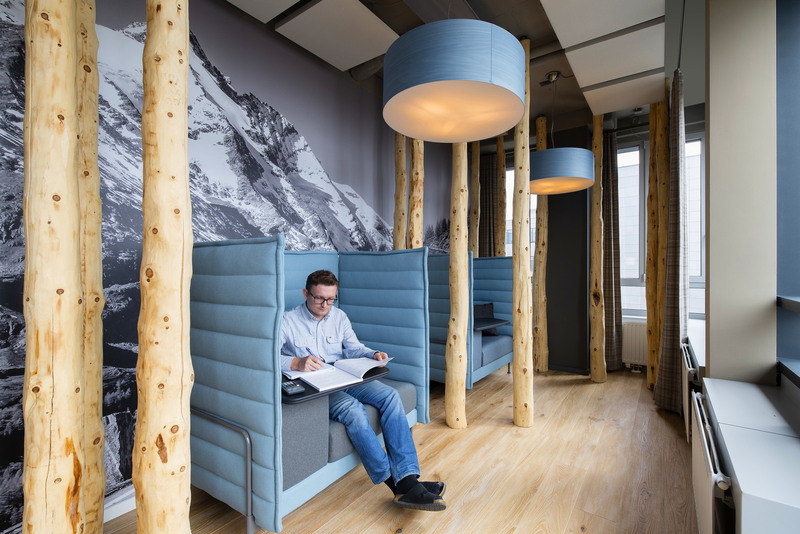 So, Evolution Design opted to create a RETREAT area modelled on an Austrian mountain hut, right down to log walls, cowhide rugs and visuals of the Alps. The second step in the innovation process is DIALOGUE, where ideas are first brainstormed with informal discussion and collaboration. At PULS Vario, this phase is enabled in a workshop space that provides different approaches to discussion and debate, including long, shared tables and whiteboard areas as well as an informal amphitheatre for brainstorming and to give presentations to larger groups. The third stage in generating the ideas is CREATE, a high-tech laboratory, where the PULS Vario engineers can prototype, test and develop the new products they are working on. Then we come to the final stage - SHARING - where all the results of the CREATE area can be shared and that Evolution Design designed in the form of a traditional Viennese coffee house. The work areas of PULS Vario designed by Evolution Design are therefore a concrete design action that supports innovation and creativity, two factors that cannot be produced simply on demand and where interior design can make a difference.